The permanent self-closure of this duct occurs only in one-third of the infants <1000 g in the first 4 days of life; hence, the vast majority of them are candidates for drug or surgical interventions. The closure of the patent arterial duct in preterm infants is associated with an increase in blood oxygen and reduced activity of vasodilators, including PGE2 and PGI2. PG synthase has two different catalytic activities, i.e., cyclooxygenase and peroxidase. The cyclooxygenase activity catalyzes the conversion of arachidonic acid (AA) to PGG2 and catalyzes the peroxidase activity of AA to PGH2. Cyclooxygenase inhibitors, such as indomethacin and ibuprofen, compete with AA for cyclooxygenase. Paracetamol or acetaminophen is an analgesic with poor anti-inflammatory properties, which is commonly used for analgesic effects in all age groups. Acetaminophen also inhibits the production of PGs from AA by inhibiting PG synthase. Although the exact action mechanism of acetaminophen is still controversial, acetaminophen appears to have an effect on the peroxidase component of PG synthase. Peroxidase is activated at much (10 times) lower concentrations than peroxide. Served by acetaminophen at very low concentrations of peroxide (as with hypoxia). In theory, these differences lead to the inhibition of peroxidase in cases where the inhibition of cyclooxygenase occurs less frequently, and therefore, the patent ductus arteriosus (PDA) treatment by acetaminophen is more efficient in such cases. The preventive administration of indomethacin has been shown to improve the rate of permanent closure of the arterial duct. The preventive administration of indomethacin also reduces the need for surgical closure of the duct and reduces the intraventricular hemorrhage in the brain; however, the survival rate does not improve without neurodevelopmental disorder. Ibuprofen has similar effects on arterial duct closure with fewer side effects. The surgical closure of the duct is associated with a high mortality rate and poor neurodegenerative outcomes. This method is limited to the time when despite treatment with indomethacin or ibuprofen, the arterial duct has significant hemodynamic symptoms, and pharmacotherapy should not be done. There is evidence suggesting that acetaminophen causes the progression of the closure of the arterial duct, which has been most commonly seen in pregnant animal models, and one case of fetal arterial duct closure after nonprescribed consumption of acetaminophen by the mother has been reported. Therefore, if acetaminophen has less side effects with desirable efficacy, it can be considered for closure of the arterial duct in premature infants. Since there are different arguments that ibuprofen is better or acetaminophen, we investigated the effect of these two drugs in a clinical trial in premature infants with PDA. This study was a randomized clinical trial. The sampling was convenient sampling method, and the participants were randomly assigned at a 1:1 ratio between ibuprofen and oral acetaminophen groups using cards in sealed opaque envelopes. After approving the research project and obtaining a letter of permission from the university's Research Deputy, eligible preterm infants were enrolled in the study after receiving consent from their parents. There were two inclusion criteria as follows: suffering from PDA and having an age birth of <37 weeks. Then, the enrolled infants were randomly divided into two groups of 25. A group received 10 mg/kg body weight (BW) of oral acetaminophen every 6 h for 72 h, and the other group received ibuprofen at a dose of 10 mg/kg BW on the 1st day and then 5 mg/kg BW on the 2nd and 3rd days. After a week, the infants had echocardiography twice to obtain information about the closure of the arterial duct. To ensure anatomical closure, the cases of PDA that have treated, also surveying again of late-maturing closure of PDA in cases that have not been closed after medication therapy, the infant's mother was reminded to have another echocardiography 1 month later to ensure that her infant's arterial duct has remained closed. The infants, who were included in the study, were subjected to laboratory examination before intervention and taking the drug. Laboratory tests included creatinine, blood urea nitrogen (BUN), alanine aminotransferase (ALT), and serum aspartate aminotransferase (AST). These tests were repeated 24–48 h after the study to determine the effect of the intervention on them. Exclusion criteria were increase in creatinine and urine by <1 ml/kg BW per hour. The results of the tests were recorded in a predeveloped checklist and then were analyzed using SPSS version 20 (IBM, Armonk, NY, United States of America). Continuous data were given as the means ± standard deviation t-test, and the Wilcoxon rank-sum test was used to compare parametric and nonparametric continuous data between groups, respectively. Chi-square or Fisher's exact was also used for categorical data. Noninferiority analysis is a statistical method that is used to determine whether a new drug is noninferior to a drug of known efficacy. A new drug is considered at least as effective as the known drug if P < 0.05 or CL>-δ, CL is the lower limit of the 95% confidence interval (CI) of the difference between two groups; δ is the noninferiority margin. In this clinical trial, 50 infants with PDA with birth age of <37 weeks were randomly assigned into two groups of 25 given acetaminophen and ibuprofen separately. All of 50 participants completed the study, and there was no loss of follow-up. The results of the mean PDA diameter before and after the intervention in the groups are shown in [Table 1]. PDA diameter in the two groups was not significantly different before and after the intervention. Frequency and percentage of PDA closure after intervention in the two groups studied are shown in [Table 2]. According to the results, the frequency of PDA closure in the acetaminophen group was 23 (92%) and in the ibuprofen group was 22 (88%) with no statistically significant difference. The comparison of the BUN, creatinine, AST, and ALT before and after intervention in the studied groups is shown in [Table 3]. As this table shows, before and after the intervention, the mean values of BUN, creatinine, and AST were not significantly different between the two treatment groups given acetaminophen and ibuprofen. There was no significant difference in the mean value of ALT before intervention between the two groups; however, there was a significant difference between the two groups after the intervention, which was more pronounced for the group given acetaminophen (P < 0.05), but all of them were in normal range of infants. The frequency of normal and abnormal urine output in the studied groups before and after the intervention is shown in [Table 4]. In both groups, urine output was normal in all normal individuals. The frequency of gastrointestinal (GI) complications before and after intervention in the groups studied is shown in [Table 5]. Before the intervention, none of the infants had GI complications. 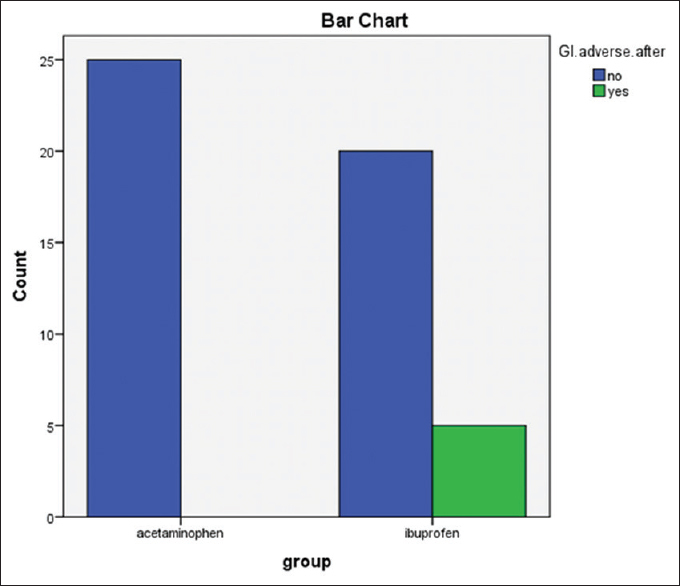 After intervention, the frequency of GI complications was 0 in the acetaminophen group and 5 in the ibuprofen group, with a statistically significant difference (P < 0.05). All of the complications were brown-colored discharge, and no active hemorrhage was observed [Figure 1]. PDA developed in 17 of 111 premature infants (birth weight 1750 g or less) born during a 4-year period (15.3% incidence). PDA, if not removed quickly in premature infants, causes the baby to develop certain symptoms such as cyanosis, depressed respiratory capacity, and shunt that endangers the survival of the infant. Preventive administration of indomethacin also reduces the need for surgical closure of the duct but is associated with several kidney and digestive complications. Ibuprofen has a similar effect on the closure of the arterial duct with comparatively fewer side effects than indomethacin. As compared to ibuprofen, indomethacin is associated with an increase in serum creatinine and a decrease in urine output and oliguria. However, the use of ibuprofen is often associated with GI complications including GI bleeding; hence, researchers have sought to find alternative drugs that are adequately efficacious and have no side effects. In the present study, with the aim of comparing the efficacy of acetaminophen and ibuprofen in PDA in premature infants, 50 neonates with PDA with birth age of <37 weeks were randomly divided into two groups of 25; one group was given acetaminophen (10 mg/kg BW per 6 h for 72 h) and ibuprofen (10 mg/kg BW for the first 24 h and then 5 mg/kg BW for the 2nd and 3rd days). In both groups, acetaminophen and ibuprofen were administered without any specific problem for 72 h. Before intervention, after intervention, and 1 month later, the condition of the duct was examined using echocardiography. In addition, the amount of urine output, GI complications, and liver and kidney function were evaluated during and after the intervention. In the present study, the use of a 10 mg/kg dose of acetaminophen at 6-h intervals for 72 h resulted in artery duct closure in 23 (92%) of the 25 infants. In the study of Akbari Asbagh et al., the administration of acetaminophen at 15 mg/kg at 6-h intervals for 48 h resulted in artery duct closure in 12 (75%) of the infants whereas in 4 (25%) the arterial ducts remained open. The lower rate of arterial duct closure in the study of Akbari Asbagh et al. compared to the present study may be due to the shorter treatment period. In a study by Oncel et al. (2013), 10 infants with PDA were treated with acetaminophen at 15 mg at 18-h intervals for 72 h. Finally, it was observed that PDA was closed in all infants. In a study by Sinha et al. (2013), 10 preterm infants with PDA with a gestational age of 33–27 weeks were treated with acetaminophen at 15 mg/kg at 8 h intervals for 48 h.
The results indicated that the arterial duct was closed after 72 h in all infants. In addition, no adverse effects were observed in the infants. In the present study, the use of 10 mg/kg of ibuprofen at 12-h intervals for 72 h resulted in arterial duct closure in 22 (88%) of the 25 infants. In a study by Heyman et al., 22 infants with PDA were first given ibuprofen at 10 mg/kg and then ibuprofen at 5 mg/kg for 48 h. The results indicated that PDA closure occurred in all the studied infants. In a study by Aly et al., infants with PDA were first treated with ibuprofen at 10 mg/kg, followed by a dose of 5 mg/kg at 24-h intervals, and the results indicated that PDA closure in 83% of the infants. There may be differences in the drug administration method in different studies. In this study, the comparison of the efficacy of ibuprofen and acetaminophen showed that the diameter of the arterial duct remained unchanged in the groups receiving acetaminophen and ibuprofen before and after the intervention. The frequency of arterial duct closure in the acetaminophen group was 23 (92%) and in the ibuprofen group was 22 (88%) without any statistically significant difference. However, the diameter of the arterial duct was lower in the acetaminophen group, and PDA closure was higher in the acetaminophen group; however, the differences were not statistically significant. Oncel et al. (2014) compared the efficacy of oral acetaminophen and ibuprofen for the treatment of PDA in premature infants and acetaminophen (15 mg/kg every 6 h for 3 days) or ibuprofen (initial dose of 10 mg/kg and then 5 mg/kg every 24 h for 3 days) was prescribed. The results showed that acetaminophen could be considered an alternative to treatment and management of PDA patients. In another study to investigate the efficacy of acetaminophen in comparison to ibuprofen for the treatment of PDA in preterm infants, acetaminophen was observed to cause fewer side effects, and in some cases, to be more efficacious, and therefore could be used as an alternative to ibuprofen. Ohlsson et al. (2012) conducted a meta-analysis to compare the efficacy of acetaminophen and ibuprofen in the treatment of PDA in preterm infants. In their meta-analysis, they found two eligible studies regarding the comparison of ibuprofen and acetaminophen. After data collection, data on 250 infants treated with these two drugs were analyzed. Based on their results, no significant difference was found between oral paracetamol and oral ibuprofen with respect to the treatment of PDA after the first period of drug use (with normal relative risk of 90%, 95% CI of 0.67–1.22, relative risk difference of 0.04, and 95% CI of 0.16–0.8), indicating the effectiveness of acetaminophen to replace ibuprofen. Studies have shown that persistent use of acetaminophen may cause liver and kidney damage and damage to blood cells. The most common side effects of ibuprofen include GI complications such as nausea, vomiting, diarrhea, and hemorrhage. In the present study, there was no significant difference in BUN, creatinine, and AST between the two groups given acetaminophen and ibuprofen although their levels were in normal range. However, after intervention, the mean value of ALT was significantly higher in the acetaminophen group. In a clinical trial to compare ibuprofen and acetaminophen, hyperbilirubinemia and GI complications were higher in the ibuprofen group; however, there were no significant differences in other side effects between the two groups. The present study shows that acetaminophen and ibuprofen have similar efficacy in the closure of PDA. The consumption of ibuprofen is associated with GI complications, and the use of acetaminophen is associated with increased levels of the liver enzyme. It is suggested that in subsequent studies, the effects of acetaminophen and ibuprofen on blood cells, hematocrit, and platelet count be also evaluated. In addition, it is recommended that patients be monitored for liver and kidney function as well as blood factors for longer periods. If increased liver enzymes and changes in blood factors are temporary and are quickly resolved, acetaminophen can be recommended as a safe drug for this purpose. According to the results of the present study, there was no significant difference between the two groups of acetaminophen and ibuprofen regarding artery duct diameter and closure rate. In addition, there was no significant difference between the two groups in average BUN, creatinine, and AST; however, the mean value of ALT was higher in the acetaminophen group. Urine output was normal in both groups; however, the frequency of GI complications in the ibuprofen group was higher than that of the acetaminophen group. These results indicate that acetaminophen is more efficacious for PDA. Radvar M, Fakor Z, Aghayr A, Gheibishah S, Sadeghi E, Azimi Y. Values of clinical criteria compared with echocardiographic findings diagnosing of PDA premature neonates. Urmia Med J 2014;25:268-74. Lago P, Bettiol T, Salvadori S, Pitassi I, Vianello A, Chiandetti L, et al. Safety and efficacy of ibuprofen versus indomethacin in preterm infants treated for patent ductus arteriosus: A randomised controlled trial. Eur J Pediatr 2002;161:202-7. Carey BE. Patent ductus arteriosus. Newborn Infant Nurs Rev2003;3:126-35. Van Overmeire B, Smets K, Lecoutere D, Van de Broek H, Weyler J, Degroote K, et al. A comparison of ibuprofen and indomethacin for closure of patent ductus arteriosus. N Engl J Med 2000;343:674-81. Mohagheghi P, Khosravi N, Mahdiazad K. Effect of oral ibuprofen in closing ductus arteriosus in preterm infants. Gorgan Med J 2010;12:14-9. Dice JE, Bhatia J. Patent ductus arteriosus: An overview. J Pediatr Pharmacol Ther 2007;12:138-46. Zahka KG, Patel CR. The cardiovascular system. In: Fanaroff AA, Martin RJ, editors. Neonatalperinatal Medicine: Diseases of the Fetus and Newborn. 7th ed. St. Louis (MO): Mosby; 2002. p. 1138-9. Jégou B. Reproductive endocrinology: Paracetamol-induced endocrine disruption in human fetal testes. Nat Rev Endocrinol 2015;11:453. Teixeira LS, McNamara PJ. Enhanced intensive care for the neonatal ductus arteriosus. Acta Paediatr 2006;95:394-403. Akbari P, Zarkesh M, Nili F, Niri F, Tofighi A. Prophylactic treatment with oral paracetamol for patent ductus arteriosus in preterm infants. Tehran Med J 2015;73:86-92. Kitterman JA, Edmunds LH Jr., Gregory GA, Heymann MA, Tooley WH, Rudolph AM, et al. Patent ducts arteriosus in premature infants. Incidence, relation to pulmonary disease and management. N Engl J Med 1972;287:473-7. Heymann MA, Rudolph AM, Silverman NH. Closure of the ductus arteriosus in premature infants by inhibition of prostaglandin synthesis. N Engl J Med 1976;295:530-3. Zahka KG, Erenberg F. Congenital defects. In: Martin RJ, Fanaroff AA, Walsh MC, editors. Fanaroff and Martin's Neonatal- Perinatal Medicine. 9th ed. St. Louis, MO: Elsevier Mosby; 2011. p. 1261-3. Chiruvolu A, Jaleel MA. Therapeutic management of patent ductus arteriosus. Early Hum Dev 2009;85:151-5. Pezzati M, Vangi V, Biagiotti R, Bertini G, Cianciulli D, Rubaltelli FF, et al. Effects of indomethacin and ibuprofen on mesenteric and renal blood flow in preterm infants with patent ductus arteriosus. J Pediatr 1999;135:733-8. Hammerman C, Bin-Nun A, Markovitch E, Schimmel MS, Kaplan M, Fink D, et al. Ductal closure with paracetamol: A surprising new approach to patent ductus arteriosus treatment. Pediatrics 2011;128:e1618-21. Agrawal S, Fitzsimons JJ, Horn V, Petros A. Intravenous paracetamol for postoperative analgesia in a 4-day-old term neonate. Paediatr Anaesth 2007;17:70-1. Wilson-Smith EM, Morton NS. Survey of i.v. Paracetamol (acetaminophen) use in neonates and infants under 1 year of age by UK anesthetists. Paediatr Anaesth 2009;19:329-37. Grèen K, Drvota V, Vesterqvist O. Pronounced reduction of in vivo prostacyclin synthesis in humans by acetaminophen (paracetamol). Prostaglandins 1989;37:311-5. Oncel MY, Yurttutan S, Degirmencioglu H, Uras N, Altug N, Erdeve O, et al. Intravenous paracetamol treatment in the management of patent ductus arteriosus in extremely low birth weight infants. Neonatology 2013;103:166-9. Akbari Asbagh P, Zarkesh MR, Nili F, Nayeri FS, Tofighi Naeem A. Prophylactic teatment with oral paracetamol for patent ductus arteriosus in preterm infants: A randomized clinical trial. Tehran Uni Med J TUMS Public 2015;73:86-92. Sinha R, Negi V, Dalal SS. An interesting observation of PDA closure with oral paracetamol in preterm neonates. J Clin Neonatol 2013;2:30-2. Aly H, Lotfy W, Badrawi N, Ghawas M, Abdel-Meguid IE, Hammad TA, et al. Oral ibuprofen and ductus arteriosus in premature infants: A randomized pilot study. Am J Perinatol 2007;24:267-70. Dang D, Wang D, Zhang C, Zhou W, Zhou Q, Wu H, et al. Comparison of oral paracetamol versus ibuprofen in premature infants with patent ductus arteriosus: A randomized controlled trial. PLoS One 2013;8:e77888. Dani C, Poggi C, Mosca F, Schena F, Lista G, Ramenghi L, et al. Efficacy and safety of intravenous paracetamol in comparison to ibuprofen for the treatment of patent ductus arteriosus in preterm infants: Study protocol for a randomized control trial. Trials 2016;17:182. Oncel MY, Yurttutan S, Erdeve O, Uras N, Altug N, Oguz SS, et al. Oral paracetamol versus oral ibuprofen in the management of patent ductus arteriosus in preterm infants: A randomized controlled trial. J Pediatr 2014;164:510-40. Ohlsson A, Walia R, Shah S. Ibuprofen for the treatment of a patent ductus arteriosus in preterm and/or low birth weight infants. Cochrane Database Syst Rev 2003;CD003481.